Analytics and business intelligence (BI) play an instrumental role in enabling an organization’s business units and IT to utilize its data in both tactical and strategic ways to perform optimally. To accomplish this, organizations must not only access the data, generate and apply insights from analytics, and communicate the results, they also must ensure that the analytics are presented in a way that leads to action. One of the most effective ways to do this is to embed analytics into business processes and applications. When analytics are embedded in business processes and analytics, analyses are easier to perform and more accessible to line of business personnel. The analyses are easier to perform in part because the application collects and assembles data; our research shows that data preparation can be the most time-consuming step in the analytical process. Embedded analytics can dramatically reduce or eliminate this step. The analyses are also easier to consume because there is no need to switch context between the business application and an analysis tool. Perhaps more importantly, analytics embedded within applications can more easily lead to action. For instance, if an analysis suggests a change in pricing, the appropriate logic can be included in the application to make those changes. If an analysis suggests a marketing campaign for a specific customer segment, that segmentation can be performed and the campaign launched. 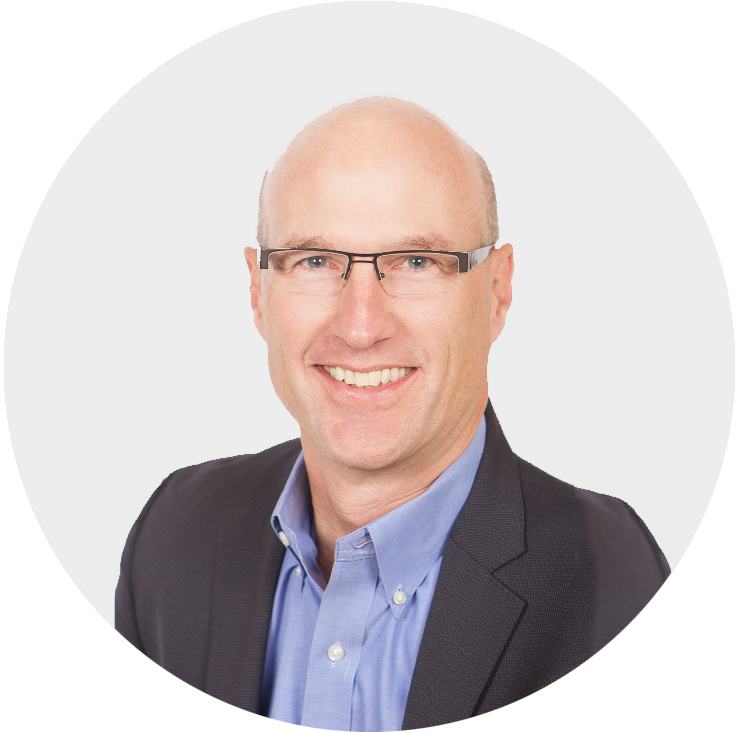 Delivering analytics and business intelligence in the context of business processes and applications addresses one of the key challenges that organizations face in leveraging the data they collect. 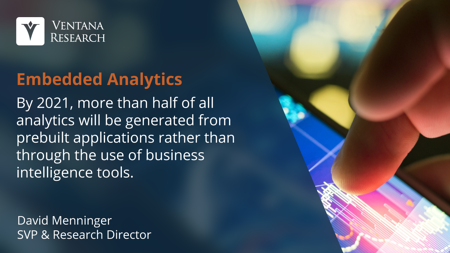 More than half of organizations (53%) report their users of analytics tools can’t perform their own analyses without IT involvement. Our research on cloud-based analytics, predictive analytics and big data analytics all show strong interest in embedded delivery of those capabilities. Analytics vendors recognize the need to deliver embedded analytics. Most have been developing and enhancing APIs and other mechanisms to more tightly integrate analytics into business processes and applications. However, it can be challenging for analytics and business intelligence vendors to package and deliver their capabilities in a way that makes it easy to embed them into other applications and processes. Vendors are working to overcome these challenges because organizations recognize the importance of embedded analytics. 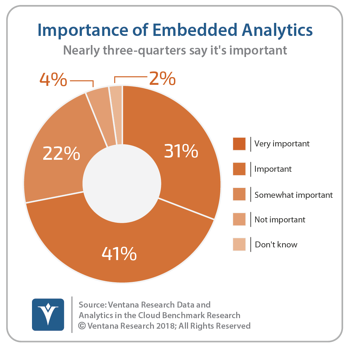 Nearly three-quarters of participants in our Data and Analytics in the Cloud benchmark research said they considered embedded analytics important. Vendors must provide tools for defining data models and accessing the application’s data as well as other data sources. Those tools will likely be used by a different audience than typical business intelligence tools. An application development team would use these tools to create the framework for line of business personnel to perform analyses. The tools must also provide mechanisms to integrate both inputs to and outputs from the analytical processes with other applications. Embedded analytics also requires programmatic access to the management and administration functions to minimize installation and maintenance of the system for line of business personnel. Ventana Research has conducted benchmark research in related areas including Data Preparation, Machine Learning, Data and Analytics in the Cloud, Next-Generation Predictive Analytics and Big Data Analytics and Integration. We have examined the expansion of business intelligence through the use of cloud computing, mobility and advanced analytics as well as how BI products use collaboration capabilities, social media techniques and location-related analytics. The findings of these research undertakings guide our comprehensive approach to our Embedded Analytics and BI Value Index, the findings of which we will discuss in our next post.